August 29, 2018, Bethany, Conn. — LATICRETE, a leading manufacturer of globally proven construction solutions for the building industry, has launched HYDRO BANⓇ Quick Cure, a liquid-applied, ready-to-use waterproofing membrane, and Quick Cure Mortar Bed, a pre-mixed, polymer-fortified thick bed mortar, to provide the industry’s fastest mortar bed shower system installation. 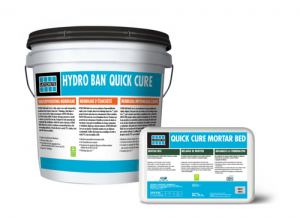 While other systems on the market may require up to four days to install a shower system, using HYDRO BAN Quick Cure and Quick Cure Mortar Bed in conjunction allows for following trades to begin tiling within hours. “Saving time and money on the jobsite has become increasingly important as the industry pushes to produce more advanced products to meet construction needs for fast-track projects. LATICRETE has created a way to shorten the entire lead time of residential and commercial tile shower installations with HYDRO BAN Quick Cure and Quick Cure Mortar Bed,” said Ryan Blair, LATICRETE Senior Product Manager. HYDRO BAN Quick Cure creates a continuous waterproofing barrier with outstanding adhesion, and thanks to its unique curing properties, allows for flood testing within 30 minutes. Additionally, HYDRO BAN Quick Cure features advanced WetCure Technology, which allows it to cure even in cold or damp environments. Quick Cure Mortar Bed boasts a rapid-setting formula that allows for foot traffic and walkability in as soon as 30 minutes after application. Quick Cure Mortar Bed is also versatile for use in both interior and exterior applications, wet or dry applications, bonded and non-bonded thick bed mortar applications, shower systems and concrete repairs. “As a company, LATICRETE is no stranger to pushing the envelope to provide our customers with the best. Together, HYDRO BAN Quick Cure and Quick Cure Mortar Bed not only save hours on the jobsite but several full days. This is the type of innovation we pride ourselves on,” said Christopher Brana, LATICRETE Product Manager. HYDRO BAN Quick Cure is available in a 1 gallon (3.8 liter) pail and Quick Cure Mortar Bed is available in a 60 pound (27.3 kilogram) bag. Both HYDRO BAN Quick Cure and Quick Cure Mortar Bed are eco-friendly emitting low VOC and components of the LATICRETEⓇ Lifetime System Warranty providing peace of mind for trouble-free installations.